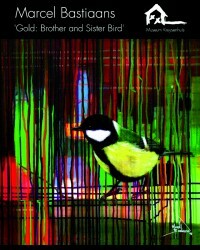 EXHIBITION 'MUSEUM KRUYSENHUIS': 'Gold: Brother and Sister Bird' | News | Marcel.. 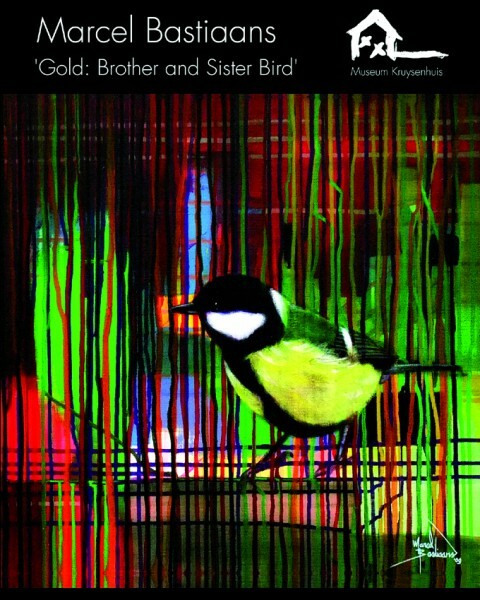 The opening of Marcel's exhibition 'Gold: Brother and Sister Bird' was hilarious. People had to wait outside because the crowd inside was too big. After all the exhibition was a big success for both Marcel and the Museum. MARCEL BASTIAANS WILL EXHIBIT IN OUR 'MUSEUM KRUYSENHUIS' FOR THE THIRD TIME. FOR US IT WILL BE THE LAST TIME THOUGH, FOR ABROAD CALLS! HIS PAINTINGS ATTRACK LOTS OF ATTENTION FROM ARTCOLLECTORS AT HOME AND ABROAD. BUT MARCEL WILL STAY AT HIS BEAUTIFUL ATELIER, IN THE IMPRESSIVE NUNNERYCONVENT. HE CALLS IT HIS ISLAND. THAT'S WHY WE WILL CONTINUE TO SEE HIM ON HIS BIKE AND THAT HE WILL CONTINUE TO WORK FOR CHARITY. HIS DIFFERENT STYLES OF WORK IN THE LAST COUPLE OF YEARS HAVE DEVELOPED TO ONE. THE REALISTIC AND OFTEN EXPERIMENTAL PAINTINGS ARE MOSTLY COLOURFUL AND OPTIMISTIC IN CHARACTER. YOU CAN FEEL HIS LOVE FOR MANKIND, ANIMALS AND NATURE. MARCEL USES OIL- AND ACRYLICPAINT. HE COMBINES FIGURATIVE REALISM WRAPPED IN EMOTIONAL ABSTRACT. HE KNOWS HOW TO CREATE THE IMAGINATION OF FOTOREALISM FROM A DISTANCE. HOWEVER, MARCEL ONLY SEEMS TO BE THE 'INDICATOR' WHO USES FAIRLY ROUGH TOUCHES. THE SPECTATOR COMPLETES THE IMAGE FROM A DISTANCE BY HIMSELF. WE DON'T SEE EXACT WHAT HE HAS DONE BUT WE WILL EXPERIENCE IT ANYWAY. HIS VISION OF LIFE: 'TRUTH, HAPPINES AND LOVE' HAS MADE IT INTO THE PAINT. THE POWERFUL DYNAMIC AND EMOTIONAL FEELINGS WE KNOW FROM MARCEL ARE STILL THERE AND ARE EVEN STRONGER. AT THE SAME TIME YOU CAN FEEL THE DEAFENING STILLNESS WHICH REFERS TO 'THE ART OF LIVING IN THE PRESENT'. THE RESULT IS OVERWHELMING. IT'S STUNNING BOTH ON SMALL AND HUGE SIZE CANVAS. MARCEL IS AN 'OIRSCHOTS' ARTIST. HE IS PROUD OF HIS VILLAGE. IT'S HIS WARM COAT. 'THE PEOPLE MAKE ME HAPPY'. OPENING ADDRESS: RAOUL VAN DEN BERG JETHS. LAWYER, ART-LOVER AND PERSONAL FRIEND OF THE ARTIST.